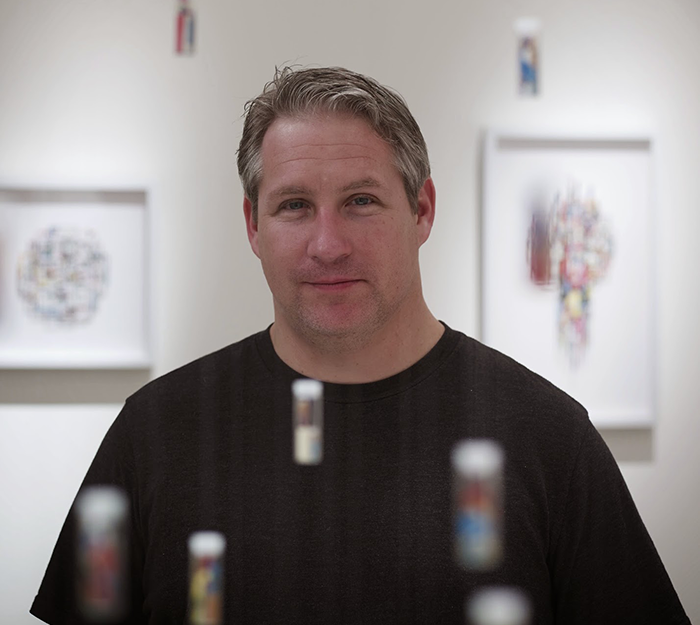 Curtis Gannon (’00) is an artist who uses the pages of comic books as inspiration — and often, as materials — in his work. Raised in a small southern Texas town, he moved to Houston with his family at age 15, and received a master’s degree in painting at San Diego State University after his time at UH. His next Houston exhibition, “Amazing Adventures in Escapism,” will be on display from May 12 to June 12 at BeDesign, 2016 W. Alabama Street. More information about his art can be found on his website. LUNAR COUGAR: Have comics always been a part of your artistic work? How did you come to use them as your primary materials, and why? CURTIS GANNON: I began using comic books as the foundation for my work during the second year of graduate school. My professors suggested I reference a source I knew intimately, and one that had influenced my life. I then started to include comic book imagery into my paintings. It wasn’t until I moved back to Houston in 2006 that I started to create my work from actual comics in the form of small collages. I realized the best way to talk about how comic books communicate was by letting them speak for themselves. I consider the work a collaboration between myself and the writers and artists I grew up reading. What do you hope that viewers will take away from your work after attending a show? Is there an ideal audience for your work? I hope my viewers will see the essence of comic books, both intellectual and aesthetic. If they can catch even a glimpse of what I love about the medium, the work will be successful. One of the great aspects of comic books is that they are accessible to almost anyone. I believe both die-hard fans and those who have never picked up a comic book can instantly connect with my work on some level. When did you know that you wanted to be a visual artist? I knew I wanted to be an artist by the time I entered middle school. Creating art is the one thing I always enjoyed and felt was continually challenging. What is a typical work day like for you? Do you travel a lot for exhibitions, spend most time working on the pieces themselves, or do you also have another type of job? I am an art handler for the Museum of Fine Arts, Houston, and I help with art installation at some local galleries after hours. I usually work in my studio 20 to 30 hours a week in the evening and on weekends. I do some traveling for the Museum, but my current exhibit at the Mission in Chicago is my first solo show outside of Texas. I started out at a local community college here in Houston, but I wanted a more sophisticated level of art education. UH has a great art department with well-respected faculty. My time at UH prepared me for the challenges of graduate school, and a career as a professional artist. How, specifically, did your time at UH prepare you for your career? The most important thing I learned from the UH art department was the reality of being a professional artist. The professors were very open about how difficult it would be to pursue a career in art, and they set solid examples for this with their own art and teaching careers. One of the best thing about my time at UH was that I received a quality education, while staying close to family and residing in my favorite city. UH prepared me to work with the thriving art community that Houston supports. I was fortunate enough to work with several great professors at UH, all of whom helped me grow as a person and a professional. My last year in undergraduate was especially influenced by Paul Kittelson. His direction, encouragement, and friendship gave me the final push I needed to pursue graduate studies in art, and the confidence to become a professional artist. Paul wrote a letter of recommendation for graduate school, but also gave me a copy to keep. It was the most complimentary and encouraging thing anyone has ever written about me. For years, I kept a copy framed in my studio for reassurance through tough times. My advice to a current or prospective UH students and artists would be to be your own best advocate, and your strongest critic. Be realistic about the investment in your education and career, and be willing to pay the price for that growth. Positive results go to those who are willing to work for them.